Hyung Seok (hee-young-suk) Jeon is a South Korean multi-disciplinary theatre artist and a projection designer based in NYC. He also works as a videographer, photographer and film-editor. In 2014, Jeon’s video work, including his short film 'Autumn' (2014), was installed by the artistic director Robert Wilson at the 21st Watermill Center Annual Benefit. In 2016, he performed in a dance puppetry piece, Tough the Tough (Redux: Steve), directed by David Neumann. 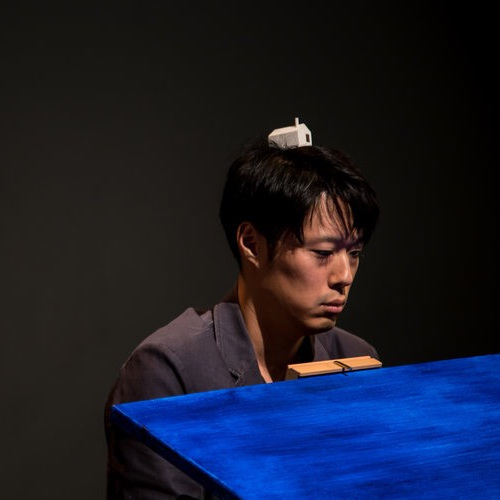 In 2017, he created and performed in How a River Carries You as a part of Puppet Blok 2017 at Dixon Place. 2018, he created and performed a solo piece A Held Posture at Theatre Lab, a meditation on generational loss in relation to sensation of sinking into deep water. He is a recipient of 2015 Fulbright graduate study award. He graduated from Sarah Lawrence College in 2017 with MFA in Theatre degree. This piece explores a sense of departure though minimalist puppetry. A canvas stands on an easel. A whale visits the canvas. The whale floats like a house. Originally developed as a solo piece for Puppet Blok 2017 at Dixon Place, NY, the project continues to focus on the process of how a consciousness forms from pre-verbal to verbal stage.